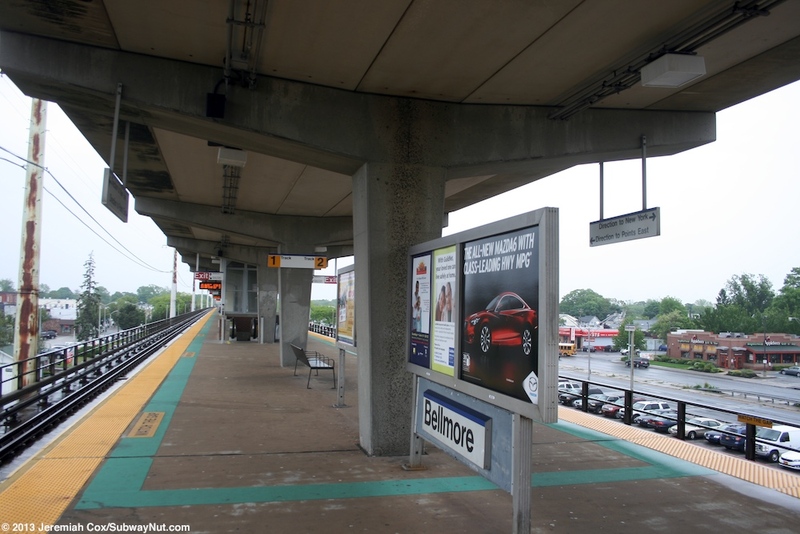 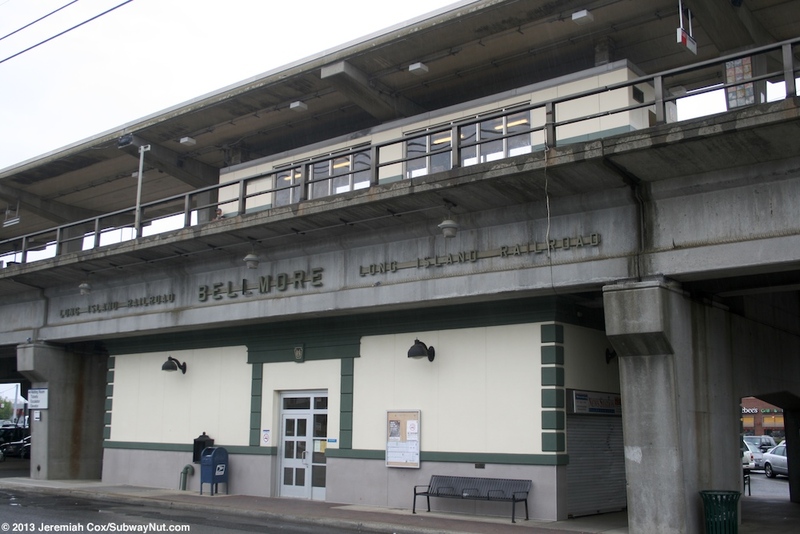 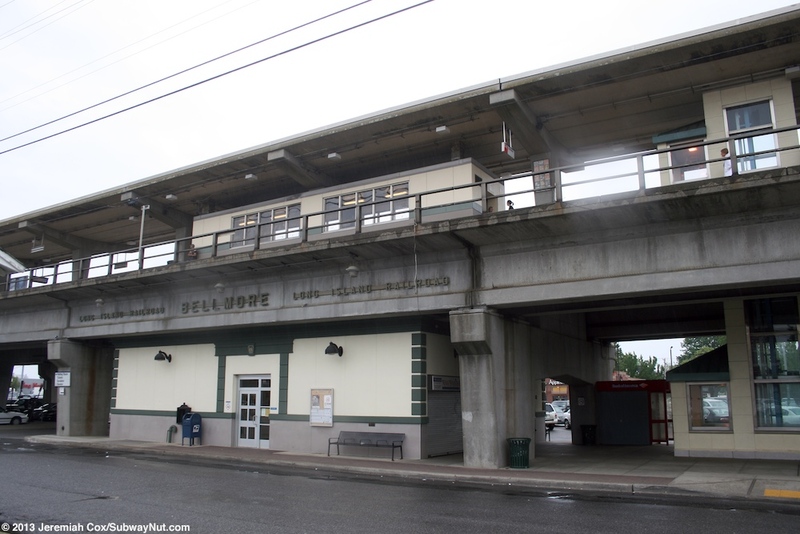 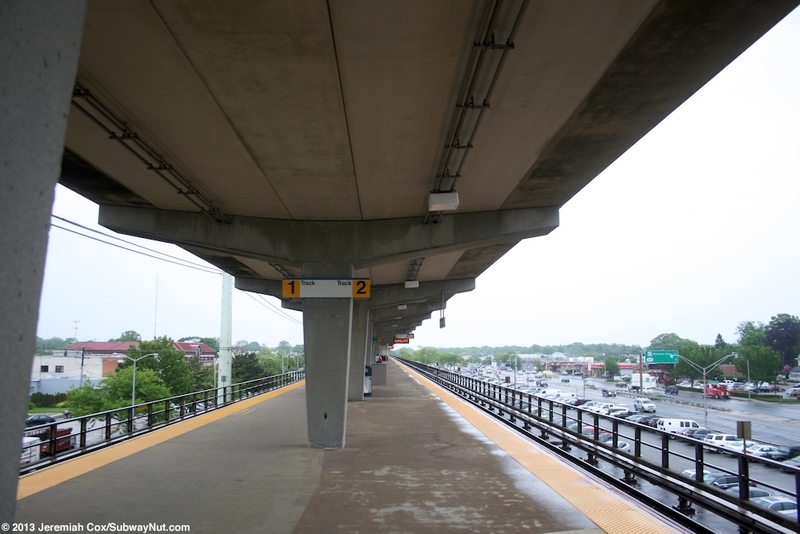 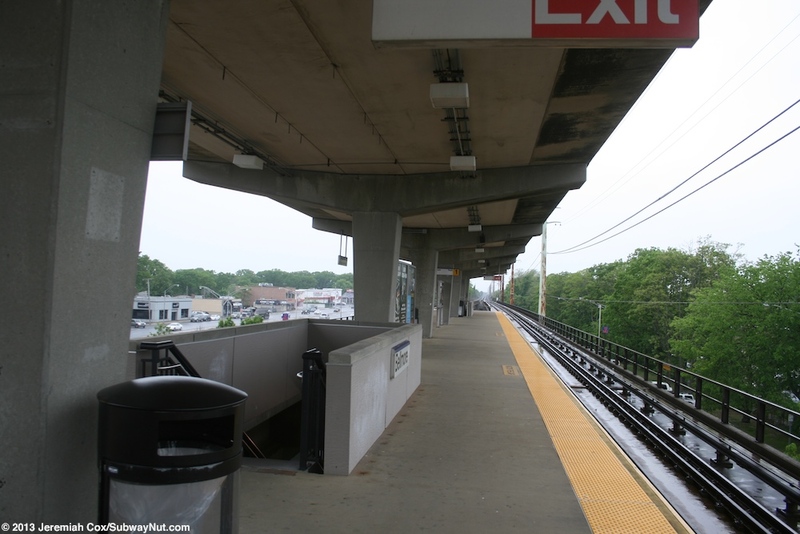 Bellmore is a modern elevated station on the Babylon Branch on a concrete elevated structure held up by modern large concrete triangular pillars. 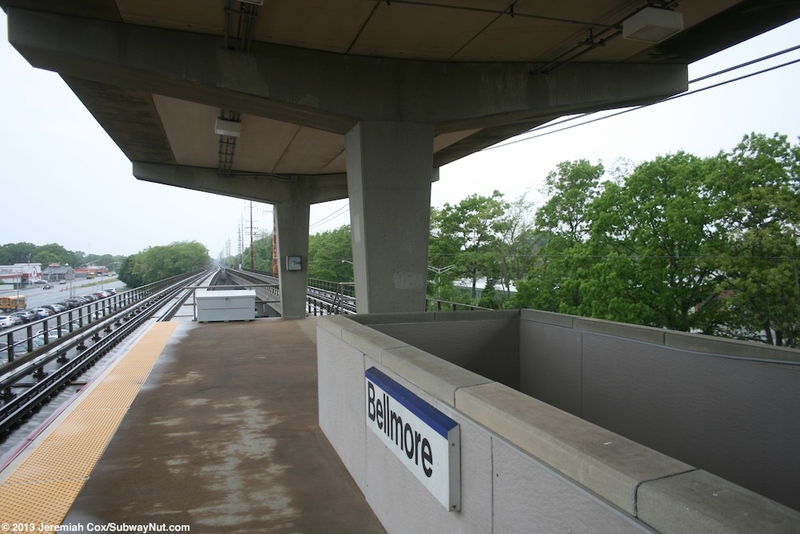 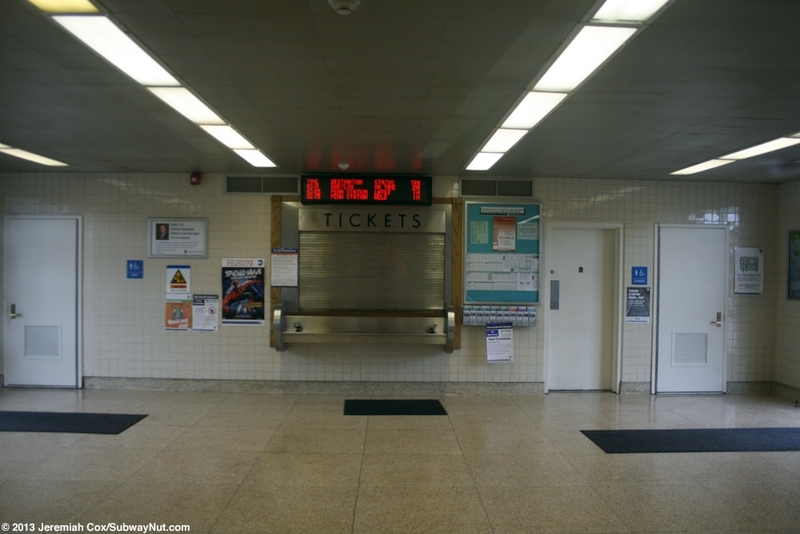 The current station opened on June 28, 1975 the same day as Merrick The entirety of the station's 12 car island platform for the two track line has a concrete canopy held up by central concrete pillars. 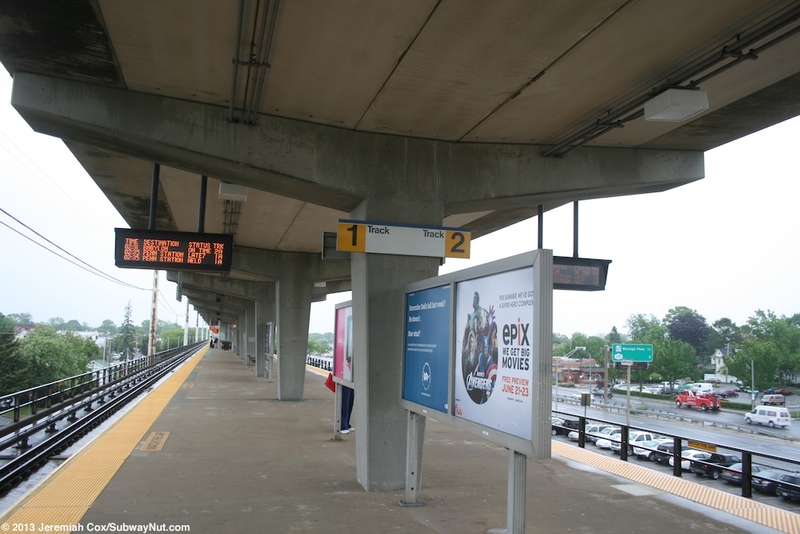 The station is just north of the Sunrise Highway, with a parking lot in-between, Pettit Avenue (with parking) is just north of the elevated with the normal parking under the station. 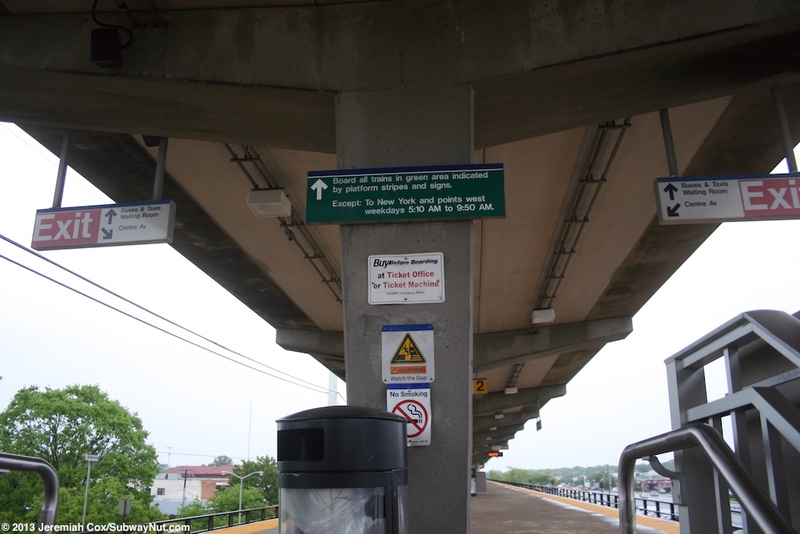 The platform runs from Center Avenue (western end) to Bedford Avenue (this bridge has a green Bedford Village sign hanging from the elevated structure). 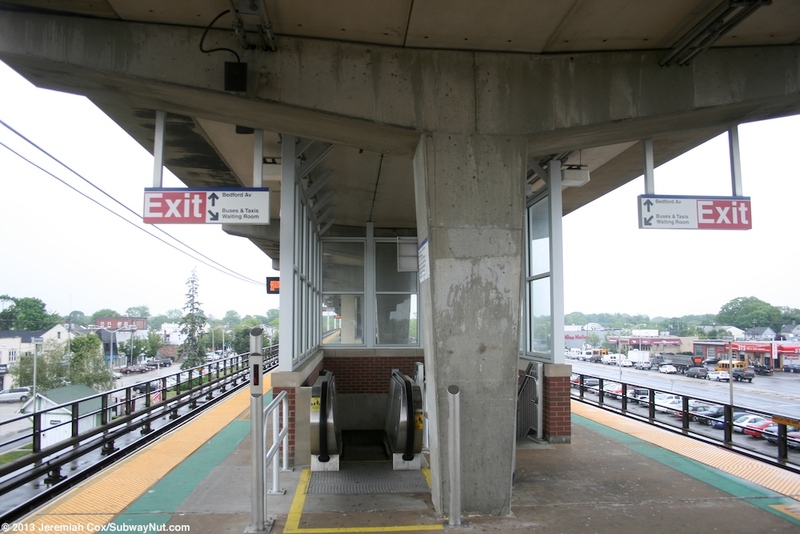 There is a staircase off the platform down to each side of these streets (four in total). 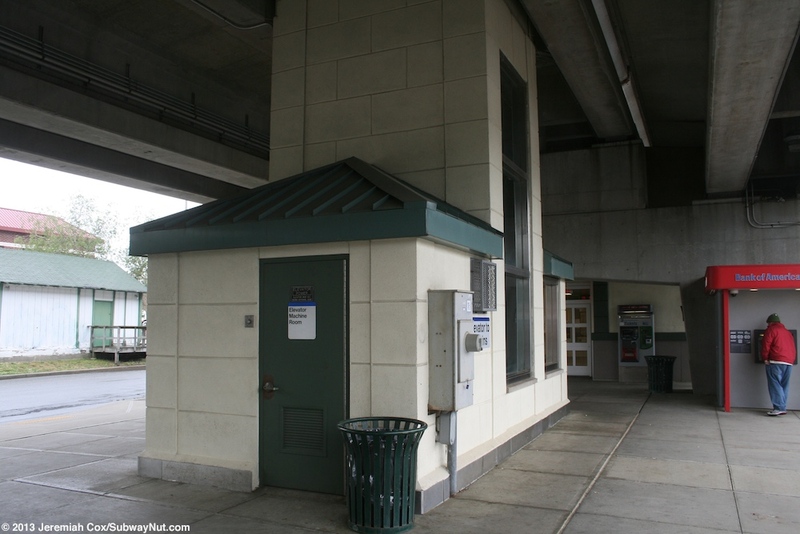 In the middle of the platform is a small shelter on the platform with doors at either end and windows. 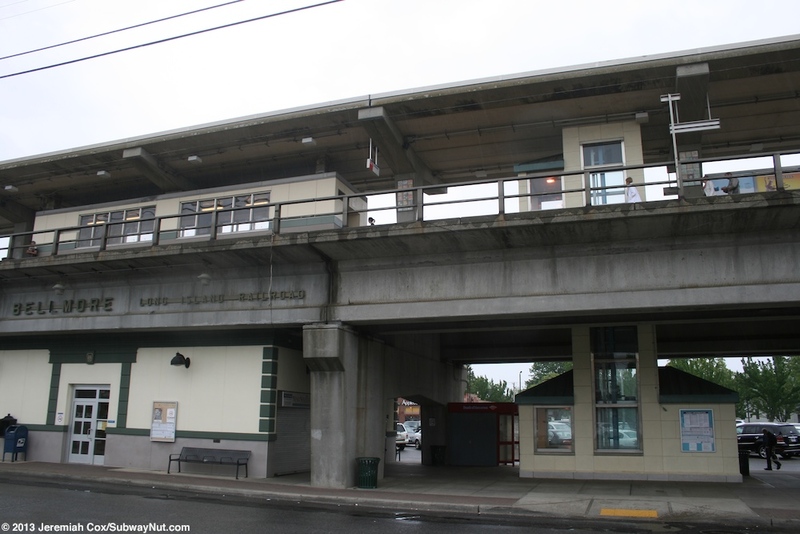 Nestled just beneath it is the station house open only when the ticket office is open from 6:00am to 2:00pm. 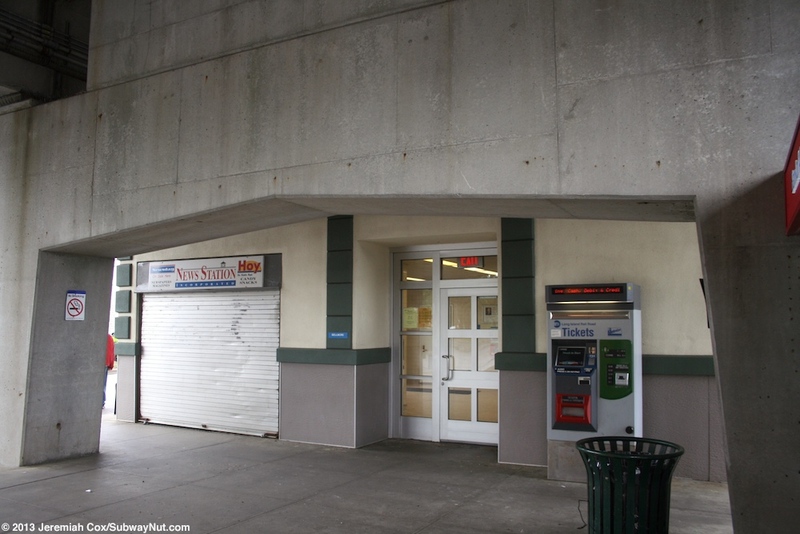 These buildings both have cream-colored concrete walls with green trim and the old Pennsy era LIRR logo above the doors into the station. 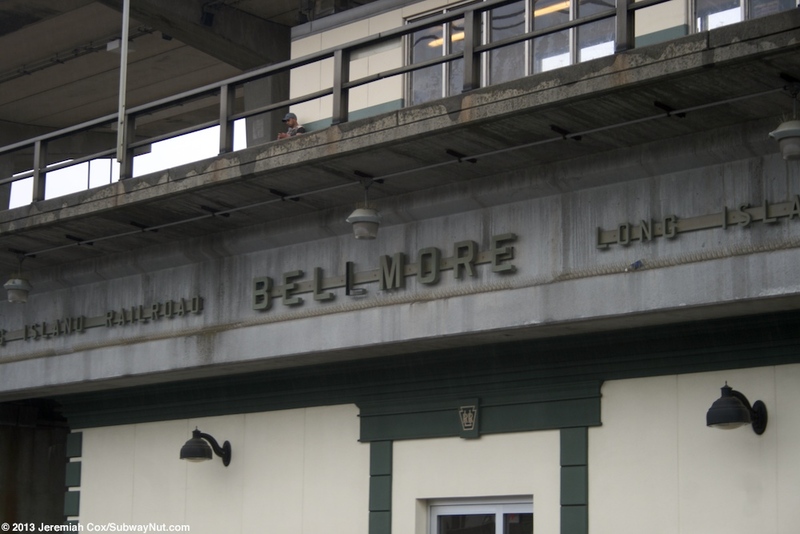 There is faded green lettering along the bare concrete sides of the tracks that says Bellmore, Long Island Railroad. 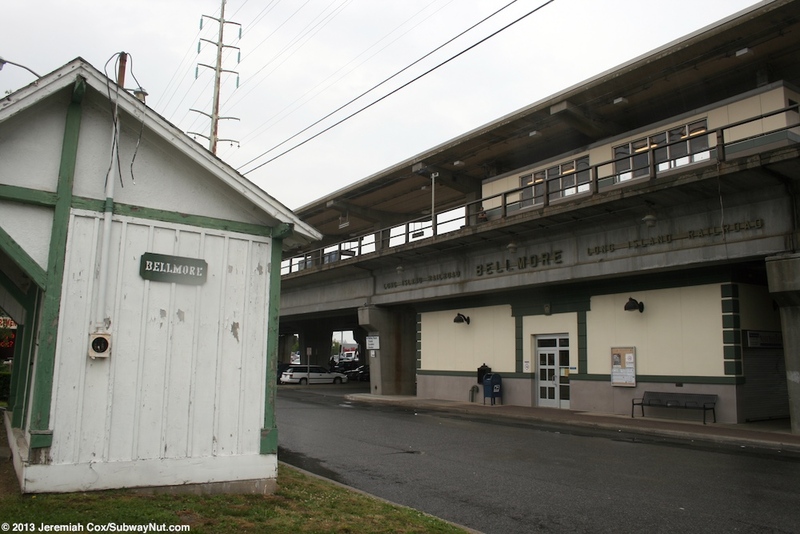 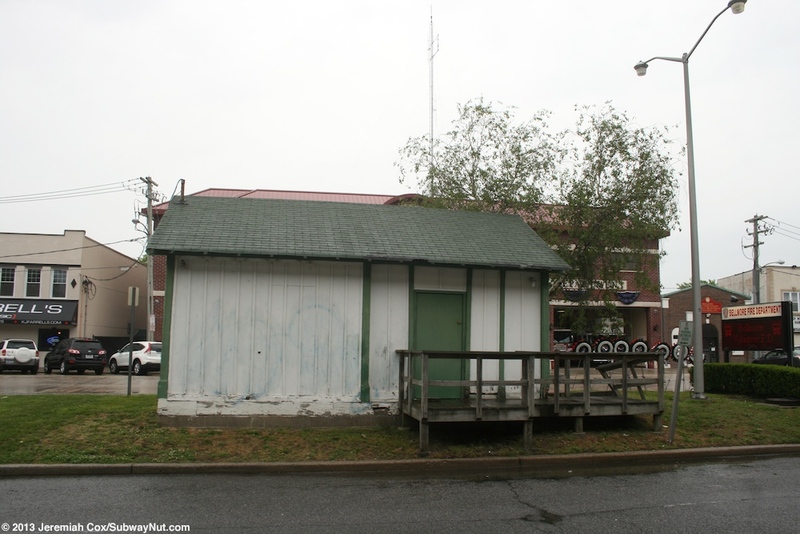 This compliments the circa 1890 historic wooden Bellmore Railroad Shelter with a small enclosed shed (that lacks windows). 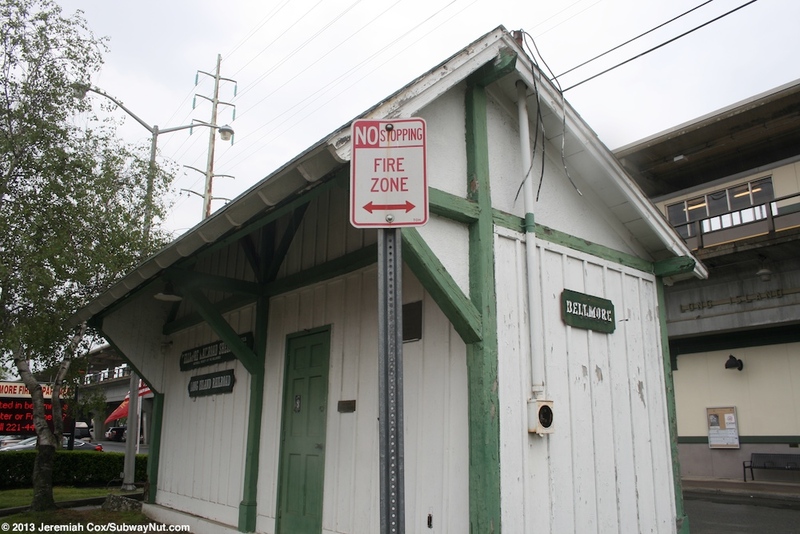 This historic shed has white walls with green trim and signs in a similar styling. 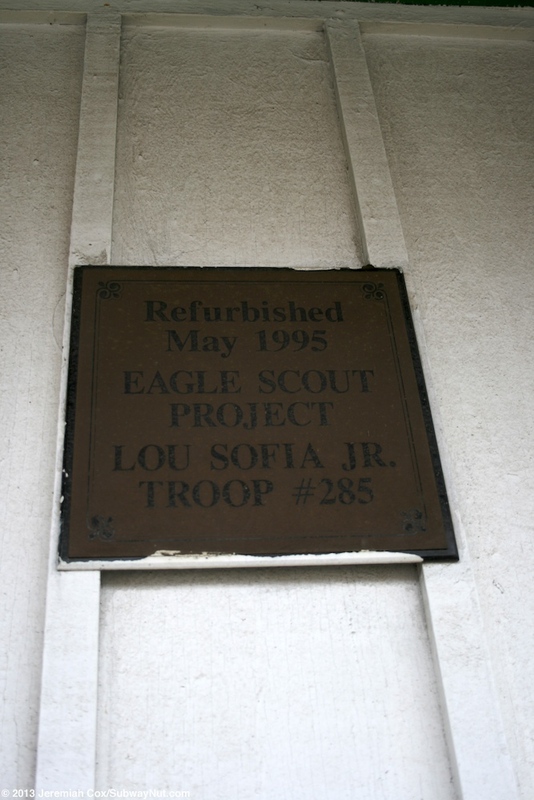 A plaque says the shelter was refurbished in May 1995 as an Eagle Scout project. 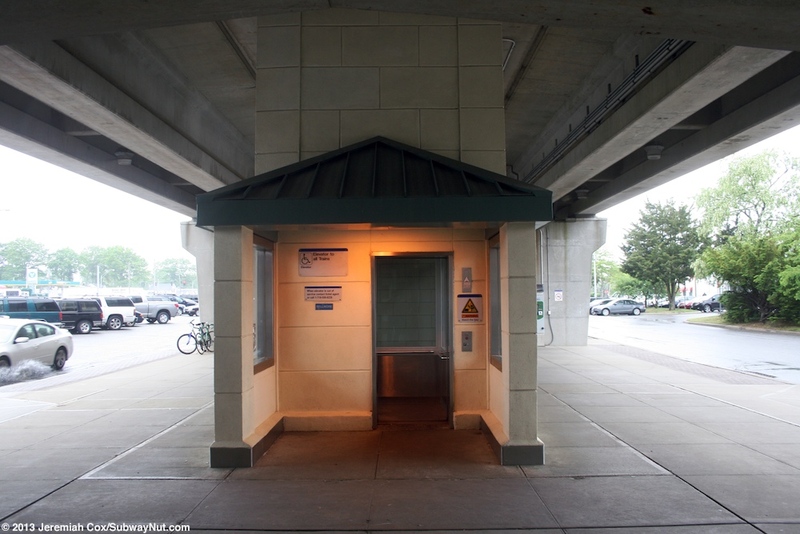 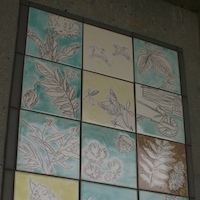 Just west of the station house is a modern elevator shaft built later with green canopies and cream colored walls at each landing. 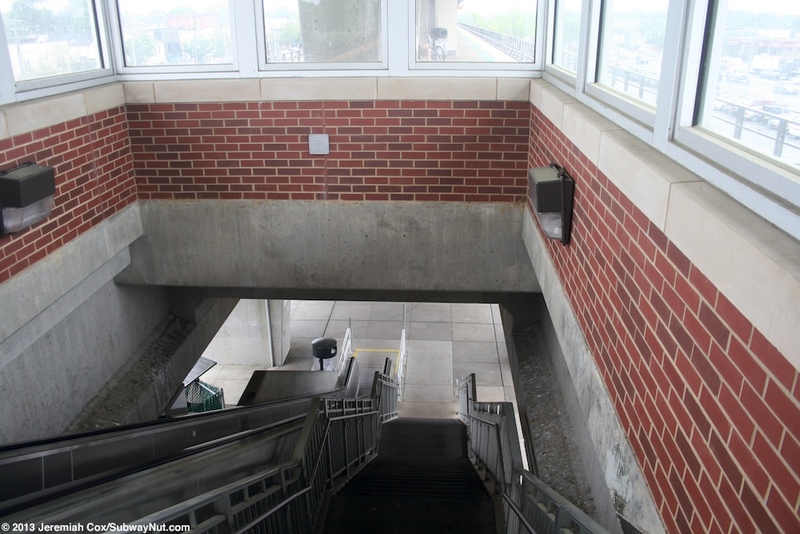 Next to this is finally a combined staircase/up escalator to the platform that arrives at an upper landing with red bricks and surrounded by windscreens.